Featured in "Eye Of The Peacock", a classic design that dates back 300 years and depicts the eye of a peacock feather, The eye represents many things but we can all agree on its beauty and the amazing display when a peacock shows its feathers. Peacocks are prevalent as art on medieval paintings and manuscripts and used in decorative motifs on churches and buildings. The peacock even appears among the animals in the stable in Christ's nativity. So it must mean something more than pride, as in the modern maxim, “proud as a peacock. 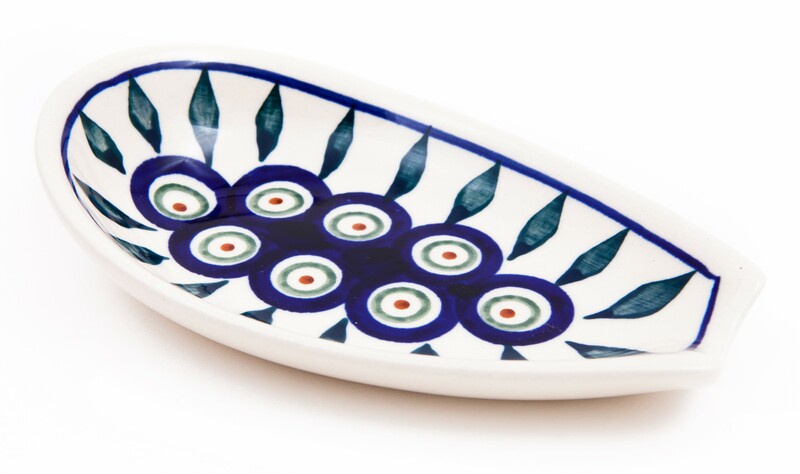 Pottery Avenue’s 5" Spoon Rest is beautiful and elegant Boleslawiec Stoneware to upgrade your kitchenware ensemble. Handmade and hand painted by artisans from the Zaklady Ceramiczne factory in Boleslawiec Poland. This Polish Pottery piece can be used on the dining table to conveniently keep your ladles and serving spoons without dirtying your table covers, as well as to keep your stovetop tidy while cooking. This durable Polish Stoneware is made to be used on a daily basis and is dishwasher safe. The versatile nature of this handcrafted stoneware from Boleslawiec makes it a great option to be used as a spoon rest, tea bag holder, soap dish and more! A national treasure, Boleslawiec ceramics have been manufactured for centuries. Developed from natural ceramic clay that can be found near Boleslawiec at the Bobr and Kwisa rivers. According to historical sources, the first stoneware was made in medieval times and in the early 16th century, local potters formed guilds to ensure perfection. Zaklady Ceramiczne "BOLESLAWIEC" was founded by one of the original men with the first pattern dating back to 1759. “EYE OF THE PEACOCK 5” SPOON REST“ is a CLASSIC pattern based of the 300 year old pattern "EYE OF THE PEACOCK". Designed by top designer and imported by Pottery Avenue, the premier importer of Polish Pottery & Polish Stoneware.